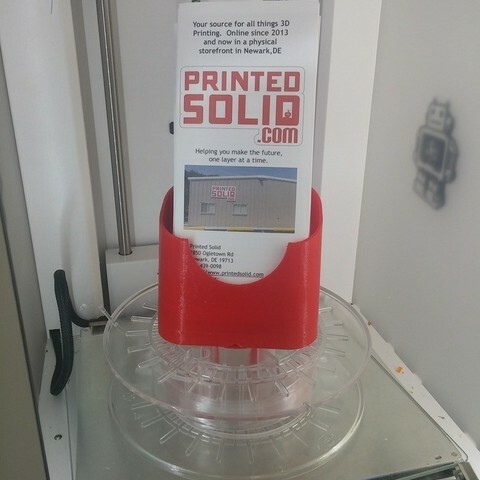 Print the hub and the holder, glue together, and insert into a 53mm bore spool. It was specifically designed around colorFabb spools, but I'm sure it will work on many others. Also note that there are two versions of the holder. One with no support (also happens to be sitting upside down) that you may be able to handle that bottom cutout with bridging, and one with built in support disk. The built in support disk is way better if your slicer can handle it. There is about a 0.5mm gap between the top of the disk and the bottom of the opening. I found that Cura just couldn't do it for some reason, but simplify3D has no problem. So, the slicer you use may dictate which version of the file you print.